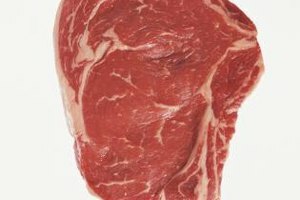 Delmonico and ribeye steaks come from standing rib roasts. One of the more pricey cuts of meat that patrons can order in many steakhouse or fine dining establishments is prime rib. A properly cooked prime rib has a flavorful crust on the outside and is pink or red in the center, depending on the customer's taste. Prime rib comes from the standing rib roast, which is part of the rib primal cut of a beef cow. To achieve an ideal prime rib cut or other rib roast slices, cook the standing rib at a high temperature. To do this, roast the meat in an oven or use a rotisserie, either on a grill or as a stand-alone rotisserie oven. Preheat the oven to 450 degrees Fahrenheit. Move the top rack in the oven to the lowest level, removing any other racks, if necessary. Rinse the standing rib roast under cool running water. Pat the meat dry using paper towel. Lightly score the surface of the meat, at 1/8-inch-deep or less, using a knife in a criss-cross manner. Allow the meat to sit at room temperature for at least 30 minutes, up to 2 hours, to ensure it cooks evenly. Season the surface of the meat. Using salt and ground black pepper is often all the seasoning you need; additional spices and seasonings to consider include onion powder, garlic powder, or paprika. Place the standing rib roast on the roasting pan with the fat side up, ribs down. Place the pan into the oven. Cook the standing rib roast for 20 minutes, turning the meat with tongs every five minutes to sear all four sides of the meat. Reduce the heat of the oven to 325 degrees. Cook the standing rib roast with the rib side down until an internal temperature of 120 degrees, for rare, is reached. Use an instant-read thermometer to determine the meat's temperature. Cook 5 or 10 minutes longer for medium rare. Remove the meat from the oven and from the broiler pan. Allow the meat to rest for 10 minutes to allow for carryover cooking and to allow the inner juices to redistribute within the meat. 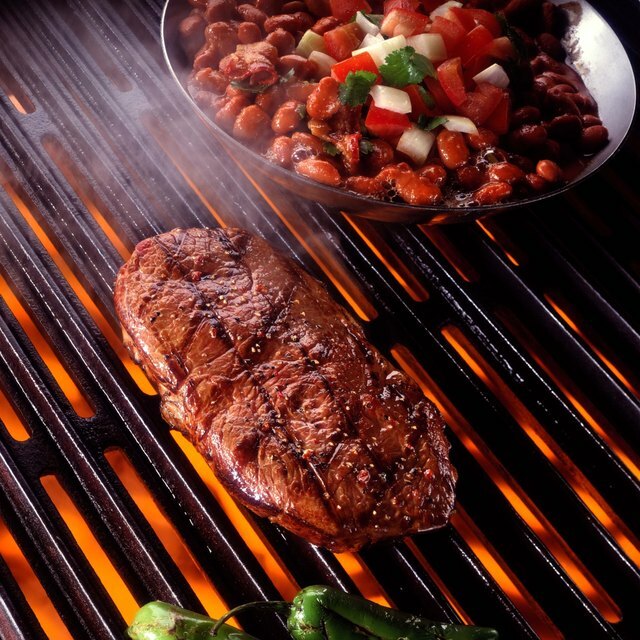 Preheat the grill on high heat if using a gas grill; if using a rotisserie oven, no preparations are necessary. Rinse the standing rib roast and pat the meat dry. Score a criss-cross pattern, cutting 1/8-inch-deep or less, into the surface of the meat. Allow the meat to sti at room temperature for 30 minutes to 2 hours to ensure it cooks evenly. Season the meat with your choice of seasonings. Place the standing rib roast on the rotisserie forks so that the meat is centered. Place the forks on the spit if using a grill, and begin roasting by turning on the rotisserie. If using a stand-alone rotisserie oven, turn on the oven and set it for 13 to 15 minutes per pound for rare and 16 to 18 minutes per pound for medium. Cook the standing rib roast until an internal temperature of at least 120 degrees is reach on an instant-read thermometer. Remove the standing rib roast from the rotisserie and let the meat rest for 10 minutes to allow the inner juices to redistribute and for carryover cooking.